The Premier League has returned after what seems a very short amount of time since John Terry lifted that famous trophy above his head in front of a packed Stamford Bridge. Well, of course we’ve had the worst World Cup ever in between all that, if you are to gauge punditry opinion across the board. I can ramble and rant about that again (believe me you don’t want me to) but instead we shall focus on a spectacular opening day in the English top flight and other events across Europe. Yes, that’s right the format is back. Six points recapping the best European football topics of the last week. Let’s crack on shall we? The start of the 10/11 Premier League will only be remembered for this game I feel. Chelsea and United played their opposition off the park, the chasing pack drew with each other. Not that these games were particularly low quality, far from it. But there was no shocking result. Fortunately for us, Blackpool announced their arrival to the big stage in the best possible manner, humiliating Wigan at the DW Stadium. As good as Ian Holloway’s side were, Wigan’s first half performance was utterly shambolic at the back. It’s quite clear to me for the £9.5 million Wigan have spent this year, they lack a leader. No Scharner, Bramble or Melchiot to lead the troops and it showed. The back four weren’t organised, and Martinez looked despondent at what was going on. He needs to sign someone with experience to get Wigan structured. To be fair to Martinez, his substitutes worked at half time. Ronnie Stam looked decent when he came on. But all in all it was a fairly disasterous day for Wigan. 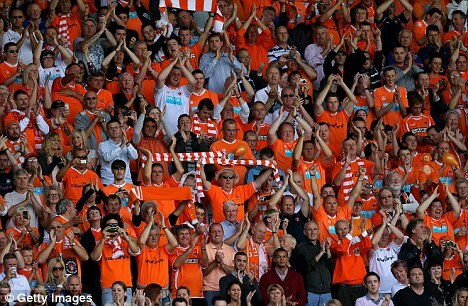 Full credit to Blackpool was laying down a superb marker in what is sure to be a tough season. Holloway is certainly creating the right atmosphere and team ethos and they’ll love every minute of being the underdog in practically every game. Doesn’t exactly get any harder than Arsenal away next. Wigan have Chelsea at home, but they did win that fixture last year. Can’t really see it this time. The first real casualty of the mega-bucks spending of Manchester City, for this year at least, looks to be Craig Bellamy. As much as I find some of his behaviour in the past to be reprehensible, I can’t really deny how good he was last year for them. His performance in the first Manchester derby last year was brilliant. It’s real shame that at the time he’s got his act together, he gets treated fairly badly by City and shipped off on a season loan to Cardiff City. A very shrewd business move by City. He was highly sought after by their rivals, so why not give him to an aspiring club one tier lower. No doubt for me now that Bellamy will be sensational in that league and he might obtain cult status at the club (more than likely already has with that amount of Bellamy shirts printed). It still baffles me how Bellamy didn’t make the 25 man squad for the league considering his level of performances last year, and I kind of hope that decision backfires on City. It probably won’t and of course this is me being slightly biased. He may well be one of the best centre-backs I’ve seen at United, but he’s becoming an irritating fool now. 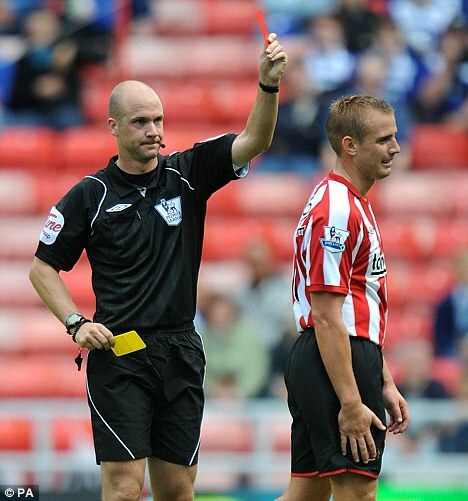 As we all know, Lee Cattermole is prone to a rush of blood to his noggin, and also drawing it from opponents with his elbow. How Bruce can slag off the ref for his officiating in the game against Birmingham is beyond me really. First yellow card may seem harsh, but I think the second offence warranted a red so it balanced out. Bruce complained at the fast-tracking of referees. He said: “The ref (Anthony Taylor) was totally inadequate. I believe he’s only been refereeing four years so that is a huge decision to promote him to the Premier League.” Has it not occurred to you, Mr Bruce that for a referee to obtain Premier League status that quickly, he must be doing something correctly and furthermore, for us to get good referees, they need to officiate at the highest level sooner or later. Bruce added “The last thing I want to do is criticise a young lad trying to make his way in the game but he was absolutely awful” Yeah well done there, Steve. Do exactly what you say you’re trying to avoid. It’s opening day, it’s not going to cost you in the long run surely. He’ll escape FA punishment as well it seems. A change of pace now as we take a Euro-trip across the other top leagues, except not as beer-fuelled. Things in France are certainly intriguing and not just with the France national team investigation that has just concluded. Champions Marseille are in an early season crisis (and no I don’t mean an Arsenal crisis as hinted at by the Telegraph). Didier Deschamps hinted at club unrest, most likely down to the decisions of Mamadou Niang, who has since left to join Fenerbahce, and Hatem Ben Arfa trying to broker a Premier League move.Deschamps said: “There are a lot of negative things going on off the pitch, but we are making a lot of mistakes on the pitch also. They are not excuses, they are explanations”. Marseille have lost both their games in Ligue 1 this season against Caen and Valenciennes. The biggest talking point from the Super Sunday game between Liverpool and Arsenal. Now remember ‘Joe Cole isn’t that sort of player’, what a ludcrious argument that is. It was in an area of the pitch where tackles like that aren’t needed and Martin Atkinson was right to send off Joe Cole. The Koscielny red card was more contentious only for the fact he wasn’t consistent with hand balls but I thought he looked reasonably assured on his debut. Not that it really mattered, Joe Cole was kept incredibly quiet by Arsenal and was outlassed by his Arsenal counterpart in Samir Nasri. Liverpool kicked on from that to take the lead through David N’Gog, who often recieves harsh criticism and unfair comparisons to Fernando Torres. He was aided by some poor defending from Arsenal though. Arsenal came back, as you’d expect and grabbed a late equaliser from Pepe Reina not being able to see a football through the sun. According to Andy Gray. Either way it ended in a draw, no surprises. Every villain needs a moustache. Mr March perhaps for Joey? Last night Twitter exploded with the news of Joey Barton’s moustache. The Newcastle squad have vowed not to shave until they win a league game. Now some people can pull of facial hair. Tom Selleck, Ian Rush (sort of) and the Red Baron from the Wacky Races. Unfortunately for none of the Newcastle players can and it could be seen for a long time yet with the way Newcastle performed last night. It wasn’t bad but they were outclassed. Could we see Joey go through different stages as the season progress? In fact I call for a calendar just for Joey Barton’s Moustaches. May’s offering could be a Fu Manchu if the situation doesn’t improve. 6pointer will keep you informed with a new feature – Toon Tash Watch.